'Nuff said really. I mean just look at this minimalist and sweet number. Having recieved good reviews at Comic Con 2012, this graffiti-style billboard only adds to the hype for next month's big movie release. Beware missing it. i have to say among the things i took away from studying modern art is an appreciation for minimalism. and i really like seeing it applied well to commercial media like this. i'm trying not to let myself get too caught up in any hype for this movie because the only thing we can say for sure about it at this point is that it'll be better then the Stallone one. but there's no denying i'm pretty stoked about seeing it based on the trailer. hey Dan i liked you Easter Egg comment on the ROM blog i hope you saw my reply. also, it looks like i'm going to be putting off that break i wanted a bit longer. Who's going to play Dredd this time? thanks Dave - glad you liked its more iconic approach too. I'm hanging out to see it as well. Not quite counting sleeps but close. Found more ROM stuff? Cool. Look forward to seeing what's ahead. 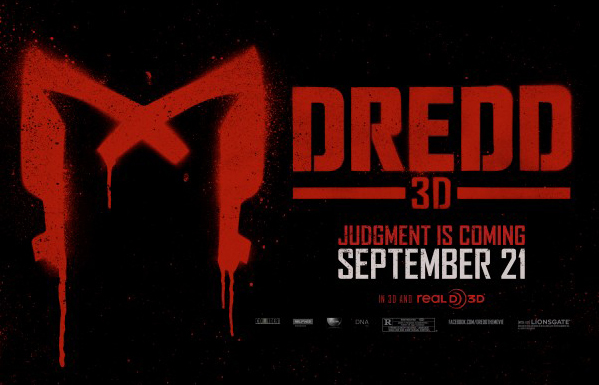 Aliera, Dredd is played by Kiwi actor Karl Urban. From films like Star Trek and Chronicles of Riddick. Talk about a guy ready to explode on the scene bigtime!